Midtown Kansas City’s expansion of their streetcar line prompts Main Street development, bringing new opportunities to the Broadway Gillham neighborhood. 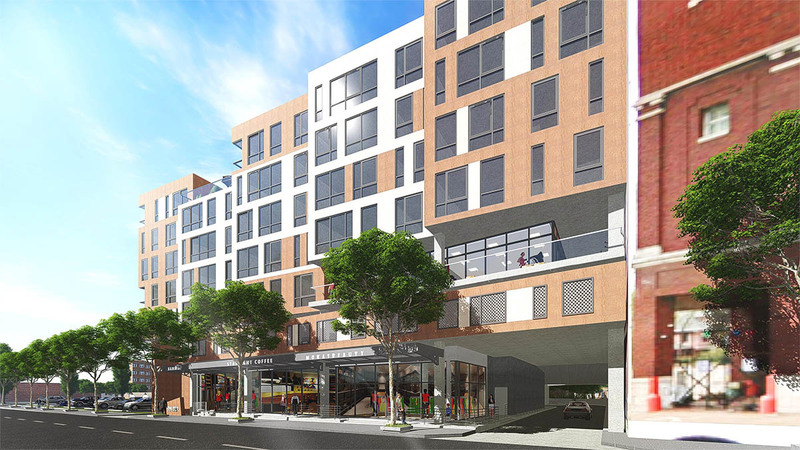 Following the proposed extension of the Main Street streetcar line, FFV Partnership contracted b+a architecture to develop a mixed-use residential and retail building whose presence would replace a long-vacant eyesore and bring much-needed quality housing and employment opportunities to the Midtown Kansas City neighborhood of Broadway Gillham. The neighborhood is in an area currently experiencing rapid growth, with a youthful demographic and easy access to shopping and entertainment destinations. Apartments and housing in the neighborhood are typically lower cost than other KC locales, so the new units had to be within a range that was viable for the local population yet attractive and progressive enough to attract an influx of new residents. A seven-story mixed-use residential/retail building with ample space for parking, a fitness center, a multipurpose room, and a large common courtyard/green space. The building would offer 83 apartments, which would include 59 one-bedroom and 24 two-bedroom units. The main floor would be reserved for 7,100 square feet of retail/restaurant space that would not only offer convenience for the residents but would encourage neighborhood foot traffic and bring an influx of revenue to the building. 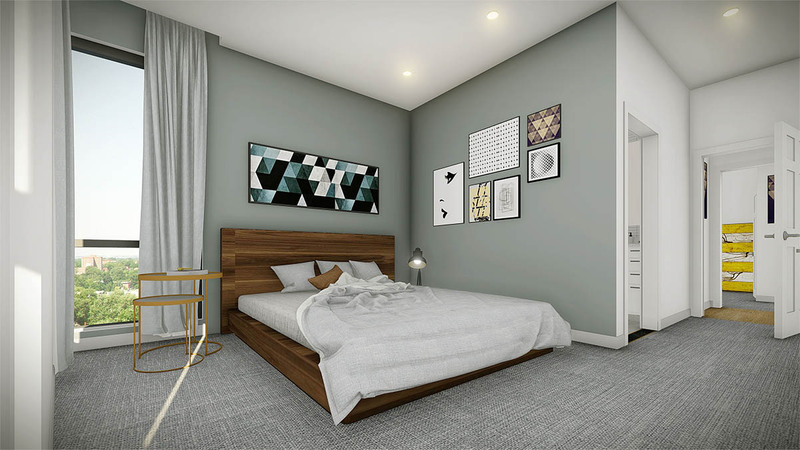 Parking for resident vehicles is provided on-site in a second-floor garage, which will also accommodate 30 bicycles, a bike repair shop, and an 18-bike hanger-rack storage. Additional parking is provided on-grade for the retail area. Permits were approved, and construction is scheduled to begin on 3260 Main Street in June of 2018 with move-in dates estimated for June 2019. We were able to expedite the process, which took approximately six months from concept to completion. The client requested that we have the project ready for construction within six months. In addition, the client was requesting property tax abatement through PIEA. We were required to make all the necessary presentations to the neighborhood associations, PIEA, Planning Commission, City Council, and to gain approval from the Main Street Special Review District during that same period. Working closely with M R Capital Advisors, LLC, the client’s consultant on tax abatement, we were able to meet that deadline. 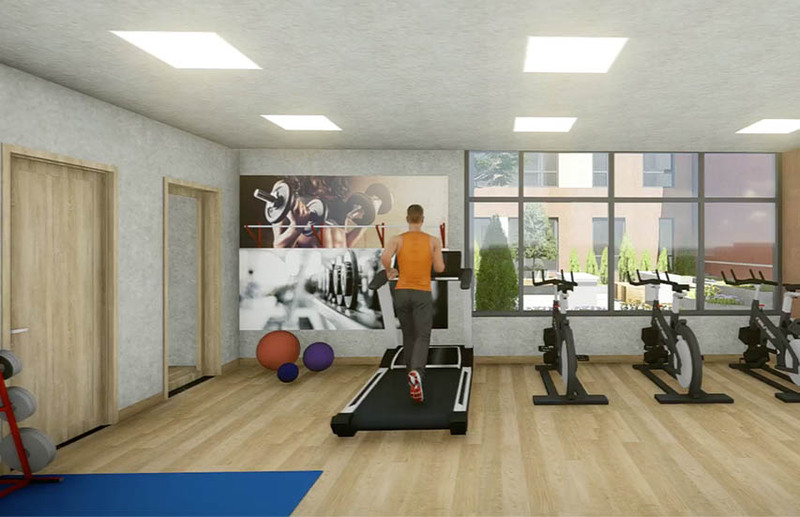 Several major changes in the project’s concept were made during the design phase, but all approvals were granted and submitted to Plans Management at the City for approval with only a small number of minor comments to be addressed. 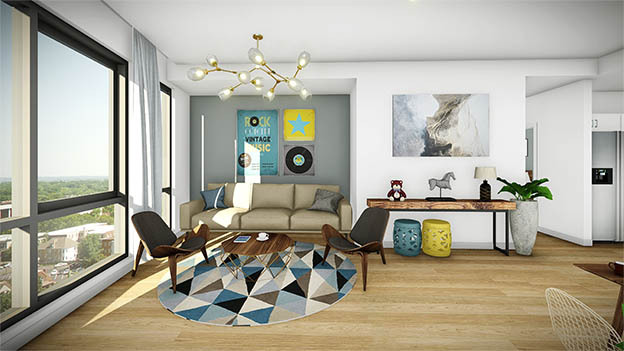 The design B+A presented featured clean, modern lines and floor-to-ceiling windows in every unit, offering ample natural light and bright, airy spaces that maximize the floorplans. 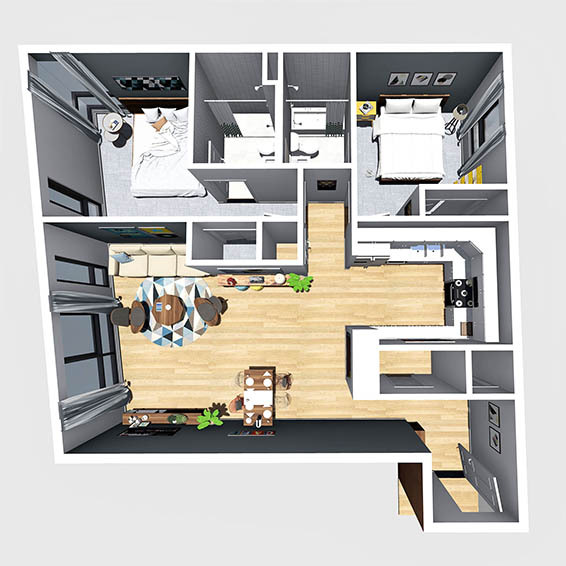 With an average size of 1,000 square feet, each unit makes excellent use the available space, providing energy efficiency, good flow, and ample room for comfortable living at an affordable price. Landscaped exterior green spaces in the central courtyard provide lifestyle enhancements and communal space for relaxing, socializing or family time. The courtyard also offers visual interest to interior-facing apartments, providing every unit in the building with an attractive view of the outdoors.